The supply chain is at the heart of the retail industry and as a global retail business with a key role to play in reducing the impact of CO2 emissions and energy consumption, SPAR is adapting its operations to be more sustainable. At SPAR, we strive to reduce our environmental footprint whilst still providing our customers with the excellent service and quality they expect. Many SPAR Partners have already taken steps to reduce the environmental impacts of their operations in Distribution Centres (DCs), realising that this is the starting point across the full supply chain. Across the SPAR network, improvements in DCs are being made in picking and packaging methods as well as resource collection processes. Implementing new innovative technologies, often brought about with the help of our preferred suppliers, allows for efficient and sustainable processes to significantly help SPAR reduce energy consumption and CO2 emissions. At a store level, the implementation of innovative sustainable technologies is also visible across the SPAR network, providing consumers with the shopping experience they desire under more environmentally friendly conditions. Specific cooling and heating technologies, which use surplus heat from refrigeration units to cool and heat stores, as well as energy-efficient lighting, provide significant positive results in energy consumption levels. 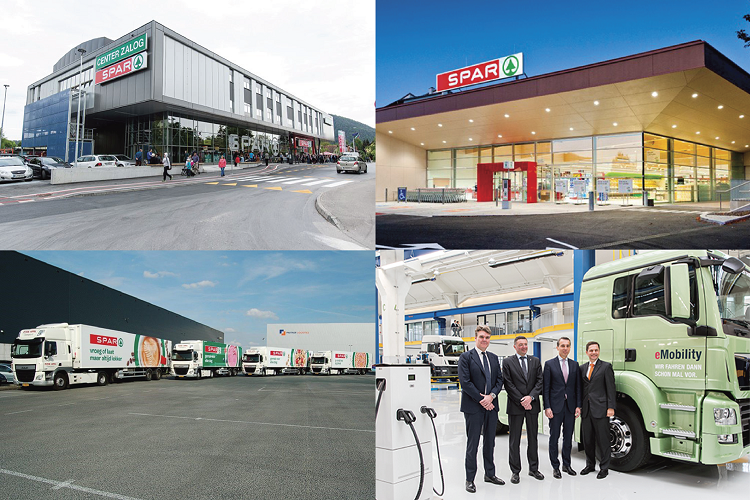 SPAR Partners have further implemented changes to their logistical operations, with a major focus on the introduction of new transport fleets and electric trucks for product deliveries, as well as innovative cooling systems. This is providing SPAR with the chance to significantly reduce CO2 emissions in an effort to move towards fully sustainable logistics. Further positive impacts have been achieved through close co-operation with our SPAR Preferred Suppliers, who offer environmentally-friendly retail solutions, DC processing technologies, and sustainable transportation technologies. To read more about our preferred supplier programme, click here. For more information about our tailored initiatives aimed at reducing CO2 emissions & energy consumption, please visit our Responsible Retailing Climate page or browse through our Pressroom for more SPAR Responsible Retailing initiatives.